Slippery as a (Swedish) fish. 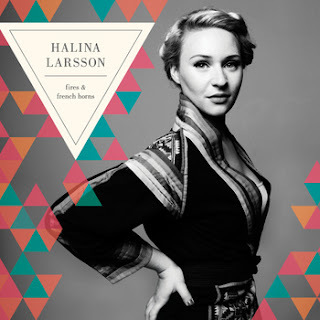 Over just seven songs, Halina Larsson crafts a captivating little album. Fires and French Horns begins with the title track [a stream of which is below], a song that hews a fine line between folk-singer and pop-songwriter. Her voice is precious and breathy, and when a xylophone augments the chorus the song risks a turn to the cloying but Larsson manages to sell a line like "I've got the right way / to tell you now / I've got the right words," and with it, the song as a whole. Though sadly, there are no French Horns to be heard. Larsson's voice takes on a dusky tone on "Puget Sounds;" the record's quiet standout. The snare provides a lolloping beat that matches the efforts of the song's protagonist to pull her lover onward in their relationship. While it's not as out-and-out country as Barton Hollow, "Puget Sounds" reminds me of some of The Civil Wars' work, especially "I've Got This Friend," and "Falling." More so than The Civil Wars, Larsson's music reminds me of Sophie Zelmani and her self-titled debut. That's a name that might ring a distant bell for some, but is likely a stranger to most (this despite having released eight albums since her debut in 1996 and an appearance on the My Best Friend's Wedding soundtrack). A fellow Swede, AllMusic described Zelmani's music as "tender singer/songwriter country" and that's likely a descriptor that will be attached to Larsson at some point if it hasn't been already. You can purchase Fires and French Horns at Larsson' Bandcamp page, and be sure to visit her website for more info. So here it is – the crème de la crème of my 2011 listening. Now that this is out of the way, I can focus on 2012 – which is already shaping up to be pretty good from the numerous records I’ve received so far. I wrote about this one – twice; once on each of my blogs. Which should be a strong sign that it would end up here. Yup, same thing with this album (though just here on Ear To The Sound). They may want that you are always happy, but it's clear that The Middle East aren't always in a positive frame of mind. My wife referred to #20-18 as my 'mope-y' section of the Top 20. It gets more upbeat at the top! I thought 2010’s Are You My Mother? was pretty strong, but it didn’t prepare me for how amazing Bright and Vivid is. Strong songwriting, strong voice, strong, strong, strong. Phe-nom-en-al. Fans of the Daptone label, Lee Fields, Syl Johnston, etc. should be all over this one. Moore’s got a rich baritone, and the band supporting him is stellar (it includes members of the Souljazz Orchestra – who you also need to check out). This is Zach Condon finding his own sound after borrowing heavily from the Eastern European gypsy sound for Gulag Orkestar and The Flying Club Cup. It took a while to get into it after loving those first two records, but The Rip Tide is a great step forward. This is the Runaways produced by Phil Spector. My wife calls this “Gandalf rock” since she thinks Hayden Thorpe’s vocals are reminiscent of a certain Lord of the Rings wizard (for the record, she puts Future Islands and vocalist Samuel T. Herring in the same category). Yes, Thorpe’s vocals are peculiar, but they are perfectly married to the music. Here's a bonus version of "Reach A Bit Further" live on the BBC. A bit different but no less lovely. Alannah & Cole are twenty-years-old. This would make me sick with jealousy if I didn’t know them and know what great people they are. Look for them to blow up big in 2012. This is the 2011 answer to my #6 of 2010. Thundercat picks up where Flying Lotus left off. This ended up being one of the most divisive choices on year-end lists. Which kinda surprises me. Could’ve likely made the list on the back of “Amor Fati” alone, but the rest of the album is pretty brilliant as well. I saw this band in Windsor several years ago when their Merge debut was about to drop. They played to a crowd that was smaller than the number of magazines that declared Civilian one of the best records of the year. Glad to see they got big. Reviewed this for Stylus, and as I said in that piece, this would’ve been my pick if I had a Polaris vote. But I don’t. Hmmmm. Dan Bejar is one of those “love him or leave him” artists. I love him. Merrill Garbus played the West End this fall – whokill was primed to make the Top 10 anyway, but that live show pushed it a few spots higher. One of the earliest releases of 2011, this one was unrelenting in how good it was. Probably the record I listened to most in the past year. My toddler can sing along to “Lose It,” which speaks volumes to the number of times this album was played in my home. Katie Stelmanis’ performance at the West End was another jaw-dropper. I may be the only person with this album at the top of my list – I honestly haven’t seen it on any others. But I am happy to be out on my own on this one. I wrote a glowing entry about it ages ago, and still feel exactly the same about Cookie Dough. Okay. So this is the last of the longlist entries. Once I recap my Top 20 of 2011, it's on to new things. I've actually already heard a couple albums this week I'm itching to write about, so expect the new stuff to be posted next week. Enjoy your weekend. Here’s another one I owe to Jeff Friesen. He’s been a longtime Perri-person and it was thanks to his championing of prior works that I was primed for Impossible Spaces. I owe Stylus a review of this one. I’m not going to blow the awesome analogy I’ve come up with for it here, but needless to say, the review will be a favourable one. I could’ve sworn I wrote about this record on this blog or Reductive Reviews, but a search reveals I did not – which is a shame, because this is a really solid record. Sister Crayon has a pretty distinct sound that captivated me. I didn’t see these guys when they opened for Arctic Monkeys in Winnipeg so I can’t confirm rumours I’ve heard about their live performances not matching up to the record, but maybe that’s a good thing. Me and loving Snailhouse go way back. Feuerstack was one of my favourite interviews of the year on TGIFR because we talked while he was scouting locations to play handball while on tour. On a list of “just missed its” in my life, being a day late to see St. Vincent at a small club in Phoenix a few years back ranks up there. WAAAAAY back when, I wrote about a band called The Dragons. That was an old album rediscovered. The Stepkids is just an album that sounds like it was rediscovered, but was actually created by guys who have supported the likes of Alicia Keys and decided to do their own thing. Not quite sure what it is about B.C. right now, but there’s a lot of classic-sounding rock coming out of that province. Yukon Blonde is the breezier AM Gold to Sun Wizard’s more muscular sound. I had the good fortune of having these guys in to play live on TGIFR this year. Here’s one of those rare instances where the album’s title perfectly describes the sound of the music contained therein. Surf Noir didn’t exist until this Winnipeg three-piece created / coined it. I actually liked this record so much I wrote about it twice. Once in Stylus and once on Reductive Reviews. Listen to this on vinyl. You deserve it. Everyone’s favourite creepy uncle returns. My countdown co-host, Jared McKetiak nailed it when he talked about this record on air. Toro Y Moi was one of the people who set the benchmark for chillwave with his first record and proceeded to jump well over it with Underneath The Pine. This came out of leftfield and grabbed my attention. Delicate, beautiful, personal. Tamara Lindeman’s sophomore effort as The Weather Station slayed me from the first listen. Here’s another one I’ve yet to review for Stylus (Taylor, I promise, I’ll be submitting these soon! ), but have been listening to for a while. Tee Pee is a fascinating label that hews its own line rather than following what others are doing sonically. Weird Owl is – in its own way – the perfect fit for them. These guys have earned a place in my year-end wrap-up pretty much any year they release a record. And the title track earned a spot in my Top 20 songs of the year. Whole Love from Spencer Tweedy on Vimeo. I wrote about these guys here on Ear To The Sound, so it shouldn’t be a surprise they made this list. Another blind find courtesy of the postal service. This album came into the station unannounced and I slipped it into my computer based solely on the fact that the band’s name piqued my interest. So glad I played it. I resisted this one at first because it felt like everybody was raving about it. But my resistance was futile. Well, I had hoped to have my entire longlist recapped before the New Years' Eve countdown aired, but unfortunately I developed a sinus infection over the holidays and between that and familial obligations, I didn't write a single word. So over the next couple days, I'm going to finish up the recap and get to my Top 20 (of which the word is already out on. Happy New Year and all the best in 2012. Now that my Top 20 songs have been revealed, the cat’s out of the bag on this one. Released early in 2011, Modern Myths held strong throughout the marathon and “One Solemn Oath” never lost its resonance. This is a spooky record that gets under your skin. The title track is amazing. How disappointed am I that Little Dragon had to cancel their Fargo show last February? That may have been the closest the Swedish act would get to Winnipeg. Black Metal. Thrill Jockey. Yes, please. This may be the Minnesota band’s happiest record in a long string of epic sadness. While I think Saturdays=Youth is a better record, this double-disc from the prolific Frenchman is still a very strong release. Here’s a record that Cretin Rob and I can absolutely agree on. I wrote about being taken with this record, so it shouldn’t come as a shock to be on here. Carpark always seems to be releasing interesting records, and Player Piano is a fitting album for their roster. Chances are, if your album got a rave review from me earlier in the year, you can expect to see it find a place on the longlist at the very least. Antibalas + Adrian Quesada + Thievery Corporation’s label (ESL) = one of my wheelhouses. Known for Casey Mecijia’s wispy vocals, this record is surprisingly muscular. More credit to Gilles Peterson for “discovering” this act and releasing it on his Brownswood Recordings label. Mark Browning’s first full-length since 2007 (not counting his Christmas album), finds him further mining the dusty roots of American music. Great stuff. Listen to "Indie Rock Radio Nation" here. For some reason I used to get this band confused with Peter and the Wolf. After Garden Of Arms, I will not be making that mistake again. As I mentioned in my Stylus review of this record, Saadiq is like a musical Dorian Gray moving back through rock history. Comparisons to My Bloody Valentine are warranted (although nothing will ever touch Loveless) and earned this Lone Star act a spot on the longlist. Pretty much the same boat as the Black Keys’ El Camino – released too late in the game for me to fully digest. Not as mind-blowing as Geneva and Station, a solid record from Russian Circles is always a welcome addition to my library.